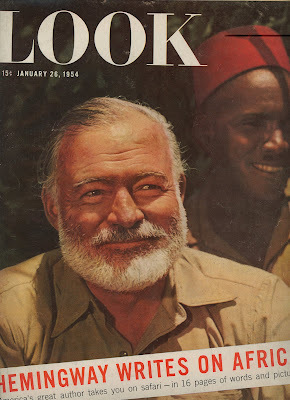 LOOK magazine, January 26, 1954: SAFARI by Ernest Hemingway (picked it up for $2 on Bedford Ave. this afternoon - amazing). 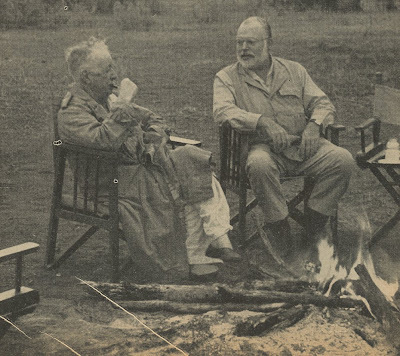 Returning after twenty years to the scene of The Snows of Kilimanjaro and Green Hills of Africa, Ernest Hemingway is on a five months' journey through East Africa. 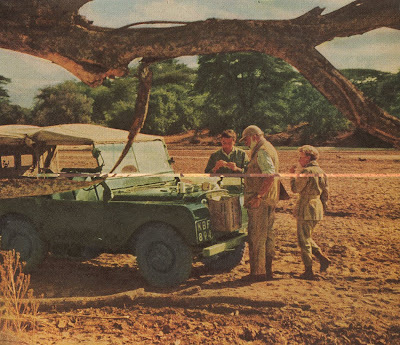 In the first five weeks, his safari ranged 2,000 miles through the wild Masai country of southern Kenya, by truck, hunting car, jeep and on foot. With him were his wife Mary, a Cuban friend, a white hunter, a game ranger, LOOK photographer Earl Theisen and 22 native scouts and safari attendants. The mountain (Kilimanjaro) did not show itself for three weeks. Then one morning it was there and it looked nothing like the Snows of Zanuck. There was not even much snow. But there was all we needed. -E.H.
Philip Percival is the finest man that I know. This statement covers very much ground and is not intended to offend good friends. Most of us good friends know we are not as fine as we would wish and are good friends anyway. Philip has only one defect. He is going to die as all of us will. But no man will do it better or give it less importance. 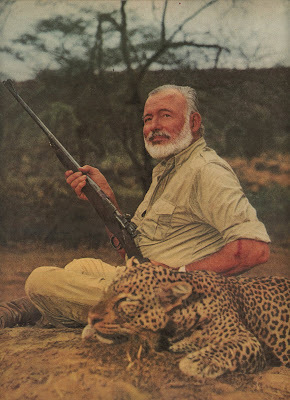 He had been retired for three years and never intended to take out a safari again. He had no need to. With many forms of the true physical suffering, from sciatica which is a pain men cannot bear, down through the simpler tortures, he was always cheerful, sound, solid, efficient and exemplary. He was also more fun to be with than anyone I know from any war or peace. He loves the animals and respects and knows them as few other people ever can. And when things start to be bad he is as young as when he galloped lion fifty years ago on the lovely broken hill of Wami. - E.H.
Breakfast in the dry river bed that we cruised in the morning for game pictures and to study the Masai dry-weather wells for watering their cattle when the rains fail. 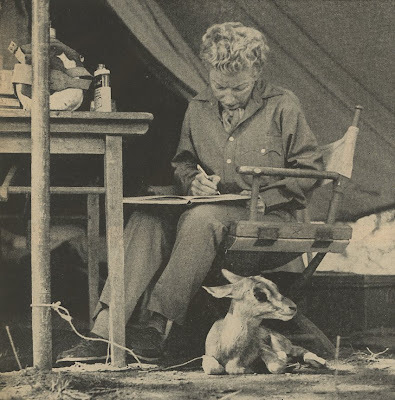 -E.H.
Mary kept a diary and a newborn Grant Gazelle. When Mary found Baa he was still wet from where his mother had dropped him. He was about the size of a jack rabbit and he could not stand. She found him in the morning in high grass where the herd of Grant Gazelle had been frightened by the lions. By noon he could stand shakily and was nursing from a bottle. The same afternoon he was butting Kibo the dog if he came too close. One time when he was tethered by a tree in Fig Tree Camp some visiting natives saw him. He distrusted and feared all people who did not smell either like Ty or Mary who fed him. They smelled respectively of good pipe tobacco and a perfume that is so expensive that I will not name it. They also smelled of soap. So Baa broke his tether and ran from the natives. They pursued him and when our Wakamba cook cursed them for frightening Baa one of the visitors started for the cook with a spear. Baa was lost in a thick country where leopards came every night after the camp meat. Everyone in the camp searched for him and when the sun was gone behind the escarpment and night came it was a sad camp and Miss Mary was crying without letting anyone see. We heard the leopard cough and the baboons speaking to him. Then the fire was burning down the trail in the firelight came Baa walking delicately and with his usual elegance to kiss Miss Mary on the chin. He had ridden it out the way Baas do in Africa. -E.H. I like your new profile picture! Jealous that you got together with Mrs. Blandings. Come to Seattle sometime! 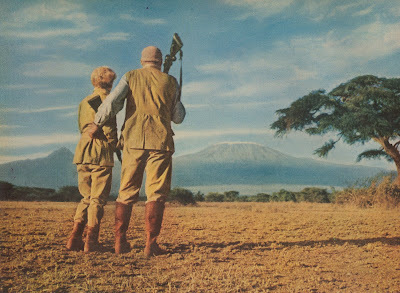 oooh, I wish my travels in Africa had been as glam as that. another amazing find- lucky duck! Awwww. Sweet little Baa. I am so glad he was not eaten. Nice discovery--thanks for sharing that happy story. CK -- Haha! Whoever said the man loved short sentences? It took ages to type all that out. BA - and how cute that they called it Baa! Leica - Seattle...a must! My grandma grew up there and loves it dearly. I never knew about the hidden city until last year! How wild. That recent Domino feature made it look so fantastic. I love their city guides. your post just made my day! Wonderful! Thanks so much for posting this! These are great -- such a man's man. 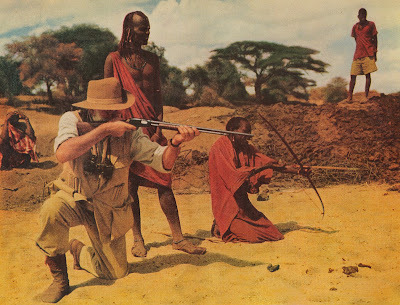 For my job, I scan and digitize old copies of Scribner's Magazine from 1900-1920's, and these remind me so much of the very popular Teddy Roosevelt safari pics they published serially. Amazing find. Reading his George Plimpton interview in the Paris Review this morning. Quite irascible and brilliant.